Wildfires Grow In Colorado; C-130 Cargo Planes Called In To Help : The Two-Way In Colorado, high temperatures and extremely low humidity are feeding wildfires, forcing the evacuation of thousands of residents from areas that include popular tourist sites. According to The Denver Post, the Waldo Canyon fire "has burned 3,446 acres and remains zero percent contained." A wildfire burns near houses outside Colorado Springs, Colo., Sunday, when the fire grew to more than three square miles. More than 11,000 residents have been evacuated. In Colorado, high temperatures and extremely low humidity are feeding destructive wildfires, forcing the evacuation of thousands of residents from endangered areas that include popular tourist sites. 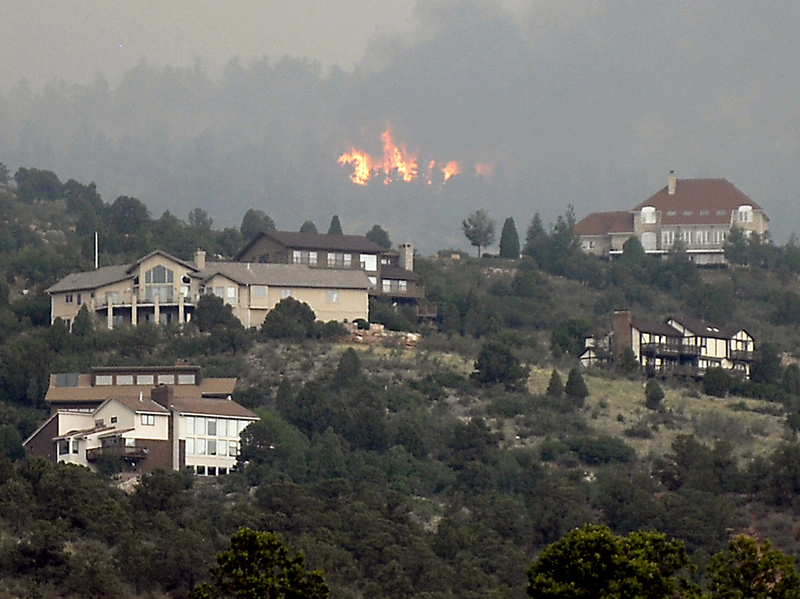 According to The Denver Post, the Waldo Canyon fire "has burned 3,446 acres and remains zero percent contained." Fires are also raging in Utah, where the AP reports that "hundreds of residents evacuated ahead of a 39-square-mile blaze." "The Waldo Canyon Fire forced more than 10,000 people to flee on a moment's notice – including the entire tourist town of Manitou Springs beneath Pike's Peak. Hundreds of millions of dollars' worth property is under threat, as flames approach high-dollar homes in the tinder-dry forest west of Colorado Springs." "Meantime, the tally of the number of homes destroyed continues to grow in Northern Colorado. There, the High Park Fire that's burned more than 125 square miles continues to march toward more mountain subdivisions. Forecasters predict no immediate reprieve in the weather either – with temperatures expected to rise above 100 at least until midweek." The town of Estes Park, near the Rocky Mountain National Park, is also reported to have been hit by a blaze that destroyed more than 20 buildings, including vacation cabins. The Denver Post reports that four U.S. military C-130 tankers, capable of dropping 3,000 gallons of fire-fighting retardant, are now in the area and may be deployed Monday. The paper says at least eight large fires were burning in the state over the weekend. More than 2,000 people are now engaged in the fight to get Colorado's fires under control. Gov. John Hickenlooper tells the AP that half the nation's firefighting fleet is now at work in the state. In Colorado Springs, The Gazette has posted a story on the challenges they face. Colorado has also issued a ban on fireworks and campfires.